2018 Datsun GO has been launched in India at a starting price of Rs 3.29 Lakhs. Its biggest competitor is Kwid, which recently got a mild update. Check out the comparison story between 2018 Datsun GO Facelift Vs Renault Kwid. After its launch in 2014, Datsun GO has finally received a facelift. When it came, it came with some segment first features and now also it follows the same path. The GO facelift gets features like a 7-inch touchscreen system, Android Auto, Apple CarPlay and more. Also, it is the safest car in its segment, given the safety features it has. While its bitter competitor also got a mild update recently. A similar feature list is also found in the updated Kwid. 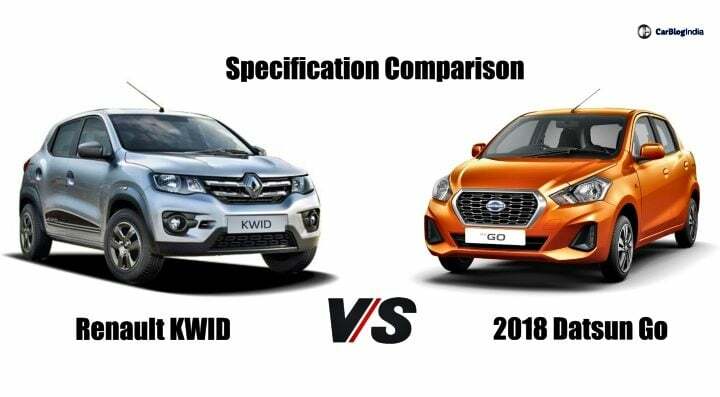 So, let’s put 2018 Datsun GO Facelift Vs Renault Kwid to know which one is a better buy. The GO Facelift starts at Rs 3.29 Lakhs and goes up to Rs 4.89 Lakhs. Comparatively, Kwid starts lower at Rs 2.66 Lakhs onwards and goes up to Rs 4.63 Lakhs. The pricing is somewhat similar between both the hatchbacks. The GO continues with the 1.2 Litre petrol engine. The engine puts out 68 BHP max. power and 104 Nm torque. It comes mated to a 5-speed manual gearbox. On the other hand, Kwid gets an extra point. It comes with 2 engine options – 0.8 L and 1.0 L petrol. The 0.8 L churns out 54 BHP and 72 Nm. The latter engine puts out 68 BHP and 91 Nm. It gets an extra point for an optional AMT offer alongside the 5-speed manual gearbox. The figures are quite obvious. GO has the most powerful engine and delivers the least mileage amongst all the three engine options available. As we see the figures, it looks like GO is a bit bigger than the Kwid in length, width, and wheelbase. However, Kwid gets a bigger height and an increased ground clearance too.